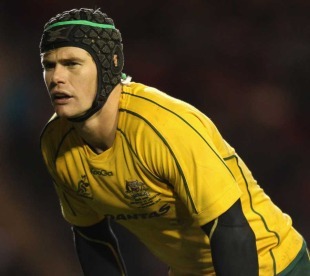 Matt Giteau and Benn Robinson have been axed from the Australia side to face Italy in Florence on Saturday. The high-profile duo have been demoted to the bench in the wake of the Wallabies' 35-18 loss to England at Twickenham, with midweek skipper Berrick Barnes drafted in at No.12 after overseeing Tuesday's loss to Munster and promising Reds prop James Slipper taking over Robinson's loose-head berth against a heavyweight Italian scrum. Brumbies lock Mark Chisholm drops out of the starting XV in favour of Reds youngster Rob Simmons, who is set to make his full debut. Scrum-half Will Genia also misses out due to a rib injury, meaning that Luke Burgess partners Quade Cooper at halfback. Brumbies utility back Adam Ashley-Cooper will win his 50th cap. Lachie Turner starts on the wing after James O'Connor returned to Australia to attend a funeral. "Berrick has really worked hard at his game and deserves his chance to start," coach Robbie Deans said. "He has also made an impact off the bench for us and he gets his chance to start from the beginning, as does Luke [Burgess]. Will Genia is coming off a knock from last week and so he [Burgess] gets his chance to do some yards in place of him. "Lachie obviously comes in due to James O'Connor's absence, but we expect him to thrive as he has done with each opportunity he's been provided with in the past."